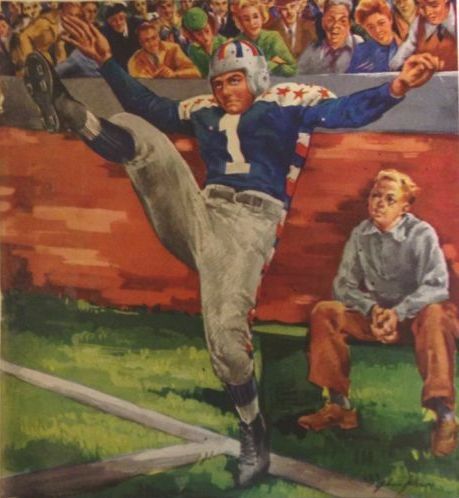 In 1946 Los Angeles got not one but two professional football teams. There had been pro football in Los Angeles before, back in 1926. Since then it had languished, however. That changed in January 1946 when it was announced that Dan Reeves, owner of the National Football League’s Cleveland Rams was relocating his team to Los Angeles. Several of the lineup would be familiar to local college football fans. Kenny Washington, Bob Waterfield. Jack Finlay, Woody Strode and Nate DeFransicso had played for UCLA. Bob de Laver, Jim Hardy, Pat West and Jack Banta were USC alum. 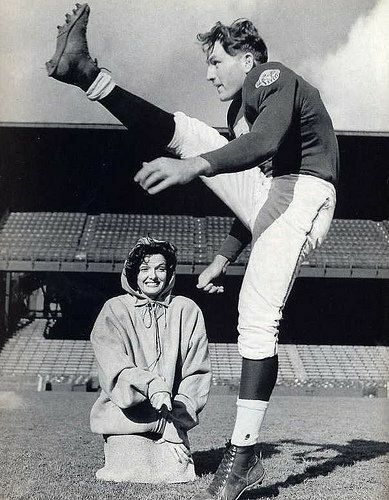 Rams quarterback Bob Waterfield with wife Jane Russell, whose first film The Outlaw made its debut in 1946. From Life 12/17/45. Their first preseason game, played at Soldier Field in Chicago against the College All-Stars on 8/24, was a poor start for pro football in the city: they lost 16-0. 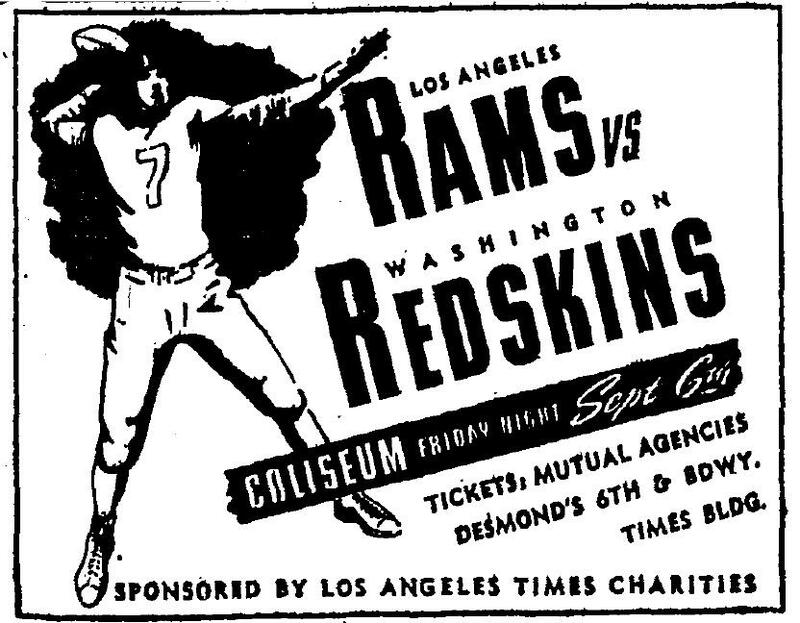 Bob Waterfield #7 depicted in an ad for the Rams vs. Redskins charity game on September 6, sponsored by the Times. But the next, a charity game against the Washington Redskins at Memorial Coliseum (aka Los Angeles Coliseum), thrilled the 68,188 fans in attendance with a 16-14 victory. 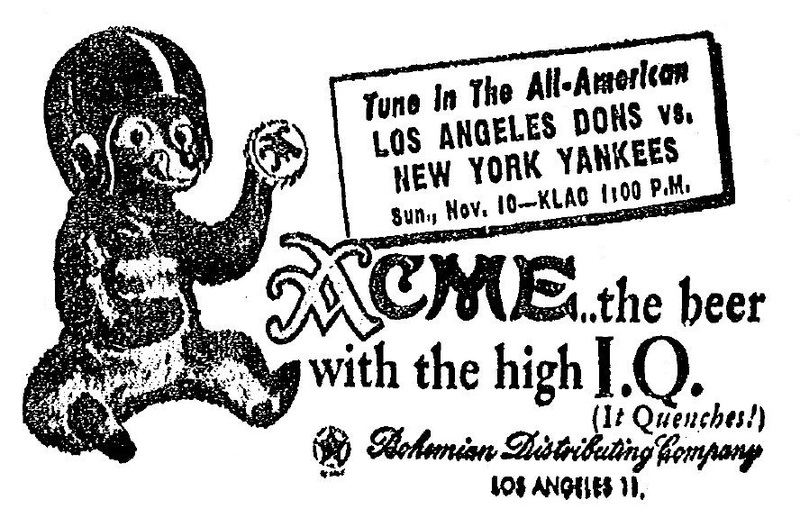 Meanwhile, Los Angeles had another pro team that year, the Dons, of the new the All-American Football Conference league. “Here Come the Dons! Nation’s Greatest Football Team…World’s Best Football Players.” The Rams, as 1945 World Champions might have begged to differ. 8/6/46. 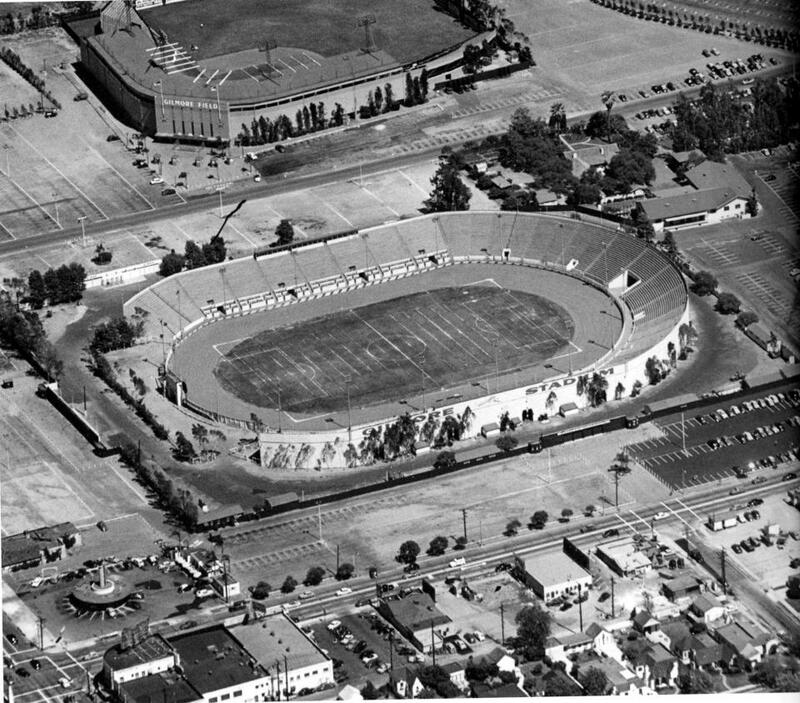 The Dons played their first local game on September 13, at Memorial Coliseum, where 20 years earlier Red Grange’s Chicago Bears had taken on the Los Angeles Tigers. A crowd of about 19,000 saw the Dons beat the Brooklyn Dodgers 20-14. L.A. Dons vs. the Brooklyn Dodgers.9/13/46. 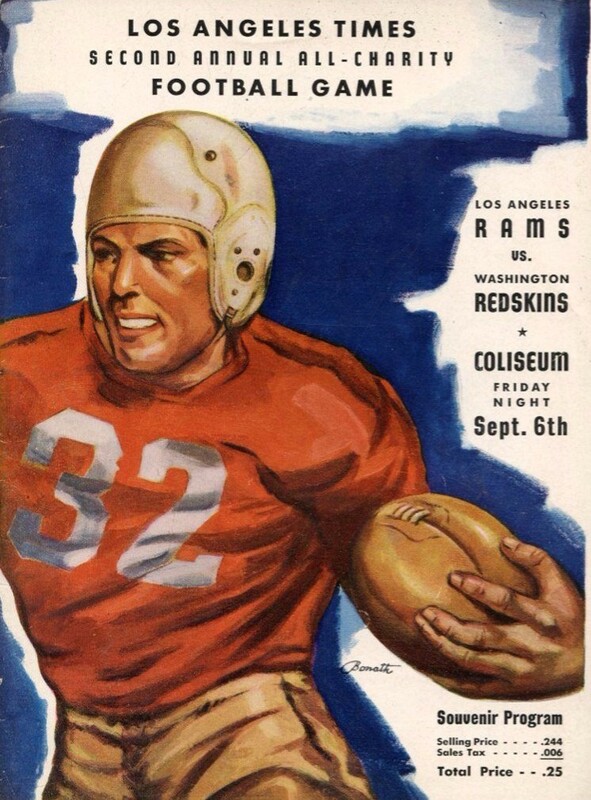 The Rams first season pro game in L.A, against the Philadelphia Eagles, also took place at the Coliseum, on September 29. The crowd of 30,553 endured 95 degree heat and the occasional thundershower only to see the Rams lose 25-14 when the Eagles pulled off a second half comeback. 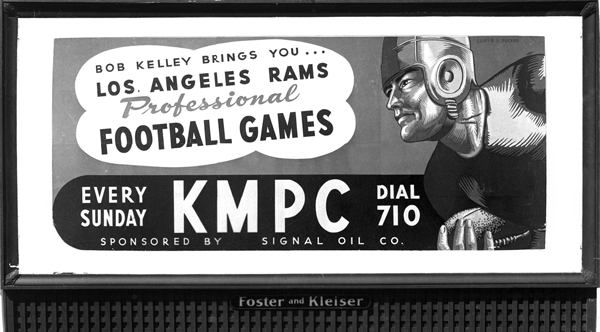 Curiously, local advertising for the Rams-Eagles game highlighted Steve Van Buren– a player for the opposition. 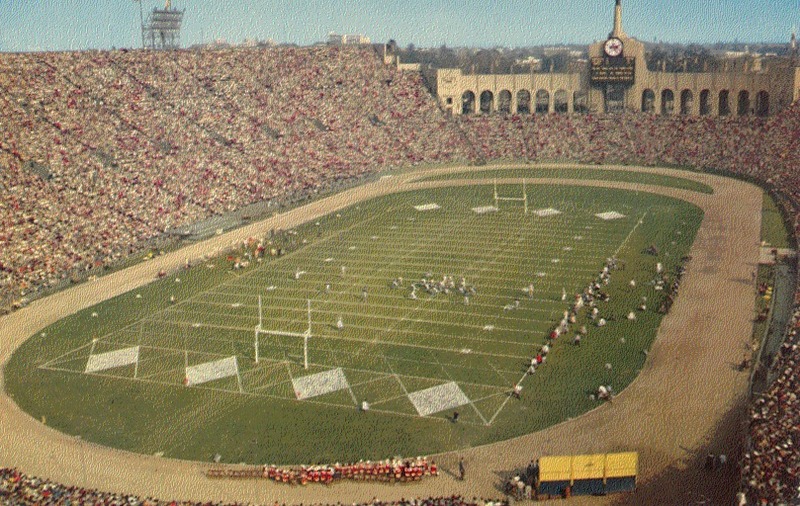 Both teams used the Los Angeles Memorial Coliseum as their home stadium. It was also used by USC and UCLA games. The Dons also played some games at Gilmore Stadium in Hollywood c.1949. Behind it is Gilmore Field, home of the Hollywood Stars baseball team. LAPL. The L.A. Dons were in existence through 1949. The Rams, after an absence of 20 years, returned to Los Angeles in 2016- 70 years after they first arrived.